After another night on the town, Saya returns home covered in blood. Same as it ever was. 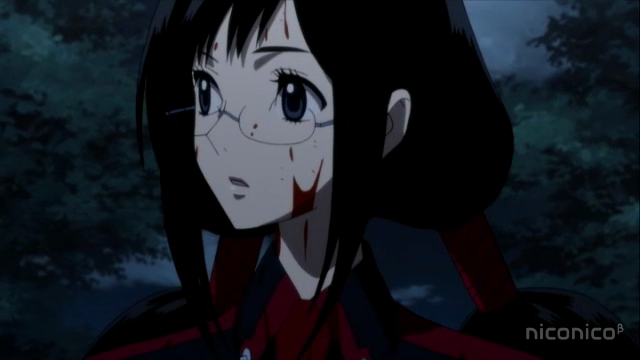 All kidding aside, this is the episode of Blood-C in which things started really changing. In the previous three episodes we have been shown a relatively unchanging, but shizophrenic story. During the day everything is peaceful and happy, especially Saya, who seems like an archetypal schoolgirl, skipping and singing to herself on the way to school. Alright she was a little too happy and carefree, and the show made note of that in several ways. Then by night, the tranquil village became the feeding ground of dangerous monsters called Elder Bairn, and Saya became a hunter, chasing them down, and killing them mercilessly with a sword. In episode 4, this unstable balance starts visibly collapsing. 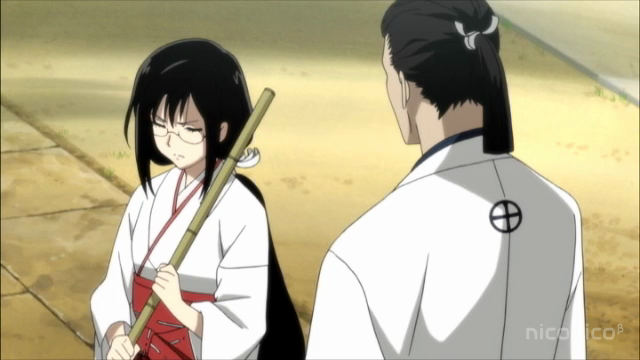 We just don't get to see enough of Saya in her Miko outfit. Apparently she only wears it early in the morning, while sweeping and meditating. This morning Saya is not her normal cheery self. She is thinking of the Bairn that demanded she "honor the covenant". Saya tells her father about the Bairn’s dying words, but he tells her to ignore what they say. Hmmm. He has all of those old books. Shouldn’t he be researching “the covenant” instead? Saya sings on her way to school, but doesn't sound convinced in her own words. One interesting thing about this episode: several characters vocalized the notion that many have been saying about this show, that nothing changes. It being daytime, it is assumed to be another peaceful day. One of the mysterious things about Blood-C is that the daytime scenes are so normal that they seem contrived, but then the characters comment upon that, so it leaves them feeling a bit unnerving. 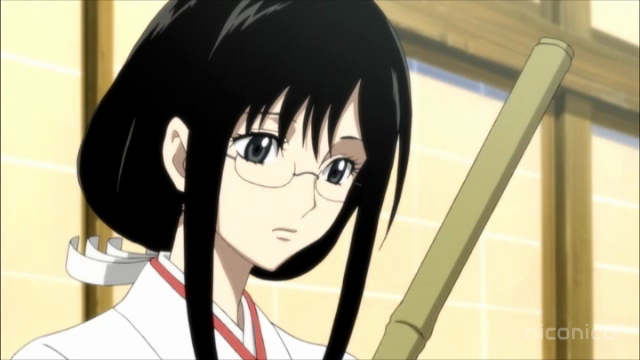 For example, at the very end of the episode, Saya shows up late, but her teacher doesn’t mind, saying it’s another peaceful day. Teachers are supposed to mind when students are late. Is the teacher aware of Saya’s nighttime activities, and thus cutting her some slack? In the last episode, the teacher asked Saya to tell her if anything happens, in this episode Fumito, the café owner, asks Saya to tell him if anything happens. These aren’t really “events”. They seem almost trivial, but one can’t help but wonder what the hell is going on. This dog has been in every episode so far. This time the dog scampered up a tree. ??? Saya chases it, and falls. 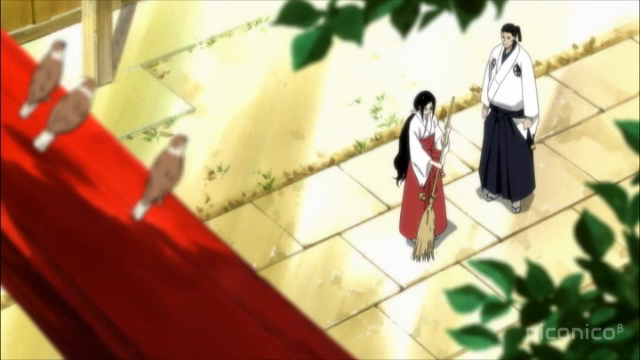 When Saya slips and falls out of the tree, Shinichirou Takizane tries to catch her, with painful results. Some have theorized that this dog is really a monster. I even wondered if it was Takizane (after all, why does he need so much sleep in the daytime if he isn’t doing something odd at night? 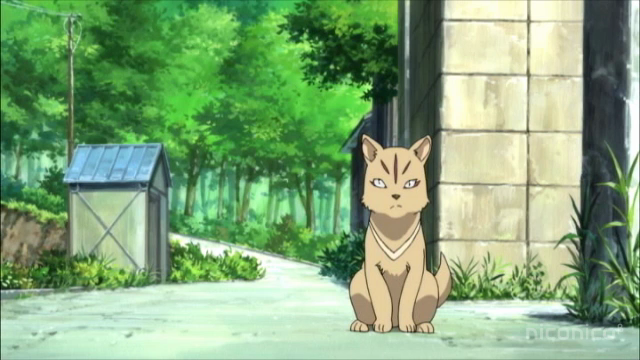 Why was he later than Saya last episode, when she stopped to play with the dog?). 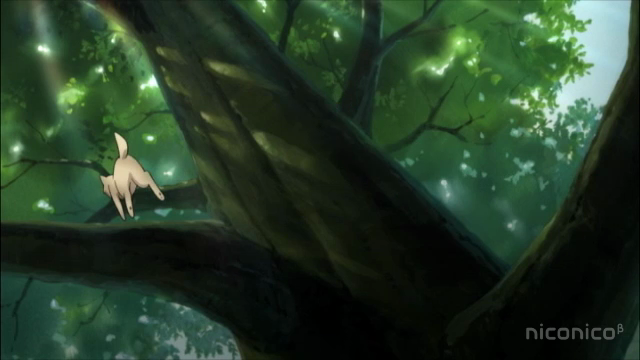 In this episode the “dog” acts very un-doglike, by climbing a tree. Oddly it seemed that none except Saya was able to see it. Is it a ghost dog? Blood-C is sure being mysterious, and refusing to reveal what cards it holds in its hand. On the other hand, if the dog turns out to NOT be a strange creature, or a person in animal form, this will have been a very skillful bit of misdirection. 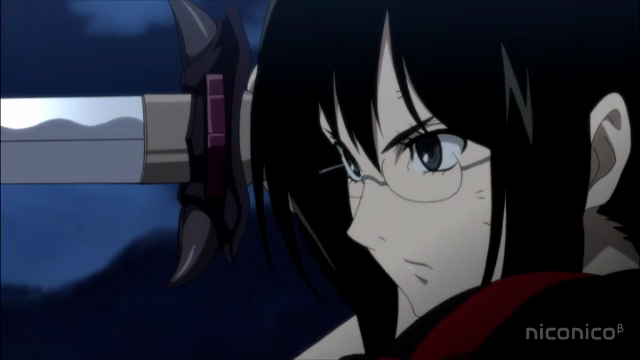 Of course, tis is Blood-C, so we get to see Saya chop some monster up. This time she fights a giant bird-like creature, that is able to control two other creatures that can spit acid. Of note, the Bairn that she fights in this episode has heard of Saya, and, like the monster in episode 3, urges her to “honor the covenant”. 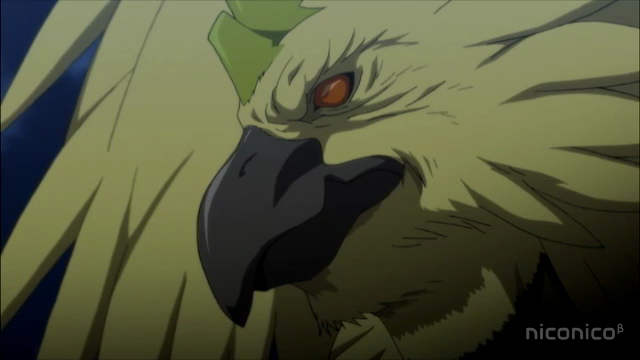 The bird creature seemed to be willing to let Saya go unchallenged, as long as it was allowed to feed upon humans. Of course, that is not how Saya sees it, so she chops the poor things up. This time the Bairn also referred to Shrovetide. In reality this is a reference to Mardi Gras, or Carnevale. In certain Christian traditions, the period before the period of fasting is preceded by a period of indulgence, eating meat (carne) or fat (gras). Shrovetide actually refers to “shriving”, which means confessing one’s sins, and thus being absolved of them. There is much that is unclear here. For example, Saya really does have a second “mode”, in which her eyes turn red, and she can fight much better. 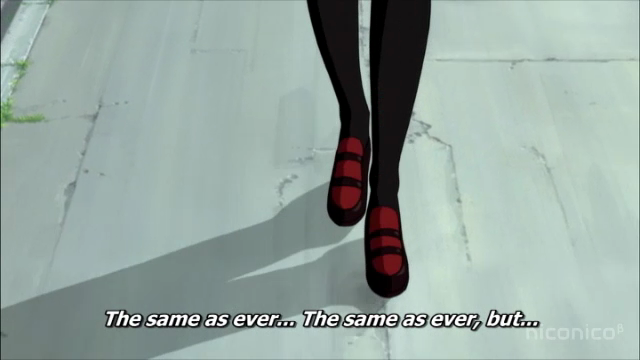 There also have been these visions that Saya has at odd times. At first they seemed to be connected to her meditation, but now they are happening at school and in the café. Finally the most significant mystery of all, it seems to me, is the “narrator”, who is always seen with a tube in which ornate vials full of blood float about. Bonus: More of Saya in her Miko uniform. Most important, what exactly is Saya? She is not normal, and she doesn’t quite seem to realize that. In fact, the Elder Bairn seem to know better than she does herself. What is the covenant? What exactly are the Bairn? Are they organized in some way? What (who) is the narrator and his mysterious collection of blood vials? Exactly who in town is much more than they seem? There is no question that the first few episodes were spent, in part, introducing us to characters so that they can be used in some way. Some might be civilians that can be endangered, after all various dead townsfolk so far haven’t had much emotional impact, since they were unknown. I can’t help but feel that at least one (probably three or more) of Saya’s daytime aquaintences will turn out to be more than that. In my opinion Blood-C continues to be an interesting (and very stylish) show. Wow that Tokizane –> Mysterious dog connection had me thinking. It was also pretty convenient that Tokizane appeared to catch Saya after she fell down while chasing the dog up the tree. At this moment there’s more questions and answers, but I’m really enjoying the mystery aspect so far especially now that they’ve made it obvious that there’s something off with Saya’s village. Yeah. Of course that is just a guess. But it would be kind of cool. I mean, it changes the way you interpret the previous scene where she picks up the dog, too.